Prepare to yield to temptation. It’s okay. Really. Brenda Cosentino’s decadent Italian fig cookies are worth the guilt. So are Dolese’s stuffed artichokes, redolent of garlic and made with handed-down-recipe love. Here’s your chance to try Mauthe Dairy’s divine creole cream cheese or Pam Warner’s hand-made tamales. There’s more than prepared foods, of course, at the Covington Farmers Market. Real farmers truck their produce in for the twice-weekly markets in historic downtown Covington--Wednesdays from 10am to 2pm and Saturdays 8am to 12 Noon. Chefs and food fans show up to score the freshest local fruits and vegetables. There are beautiful, plump blueberries and blackberries, grown just up the road. Sweet satsumas, heirloom tomatoes and regional favorite Creoles, too, vie for attention depending on the season. Regulars greet the bread lady and farmer Nick. They sample salsa and cookies, sip fresh-brewed coffee or herbal tea. Sunlight filters through the trees and, usually, live musicians playing in the small gazebo provide a soundtrack to the scene. The Covington market isn’t the only one on the Northshore. A few miles away, in Mandeville, the Mandeville Community Market is also abuzz on Saturday mornings, showcasing area arts and crafts, handmade soaps and cute birdhouses. But farmers and a number of good cooks offer fresh produce and prepared foodstuffs, too. Across the street at the same time is the Lafitte Street Market, also held on Thursday evenings from 4pm to 8pm, making it the only night market in St. Tammany. All products are hand-crafted, fresh grown and offered for sale in a neighborhood setting. Nearby, two new markets came on the scene in 2018: Pearl River&apos;s Honey Island Art & Farmers Market, held Saturdays from 10am to 2pm, and the Pearl River Farmers Market, held just up the road on Saturdays from 12pm to 5pm. The Abita Springs Art & Farmers Market tempts on Sundays from noon to 4pm. Located adjacent to the Tammany Trace at the Abita trailhead, the market offers shoppers local honey, prepared foods, fresh produce and baked goods, live music and more. 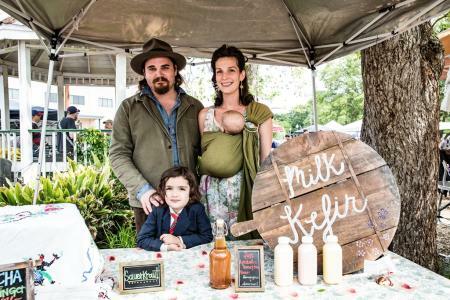 The Folsom Village Market sets up every second and fourth Saturday, mixing the farmers market with a community yard sale on fifth Saturdays. The air is festive at all the markets. And why not? Celebrating great food and nature’s bounty is a way of celebrating life and Louisiana culture, too.